a. a balcony running along or around the inside wall of a church, hall, etc. A long covered area acting as a corridor inside or on the exterior of a building or between buildings. A room, often top-lit, used for the display of artwork. (1) A long, covered, well-lit space where usually one of the long walls is replaced by columns or posts and sometimes also by a balustrade. In the first half of the 16th century, especially during the baroque period, a new type of gallery was developed in European palace architecture: a spacious hall with a succession of large windows on one long wall. Beginning in the 17th century, such galleries contained the art collections of the palace owners. Later, art museums as well as their departments came to be called galleries. In modern architecture the gallery is an important functional element of gallery houses. (2) An upper tier of a theater. (3) Figuratively in Russian, a long row, a file (for instance, a galley of set type in Russian is called a galereia). (Russian, shtrek), a horizontal, underground mine passage that has no exit on the surface and that usually follows the vein or rock in which it is excavated, in which case it may be called a drift or rock drift. Various types of galleries are distinguished according to purpose, including primary (main roads), panel, horizontal, excavation, intermediate, transport, and ventilation galleries. A horizontal, or nearly horizontal, underground passage. A subsidiary passage in a cave at a higher level than the main passage. 1. A long, covered area acting as a corridor inside or on the exterior of a building, or between buildings. 2. 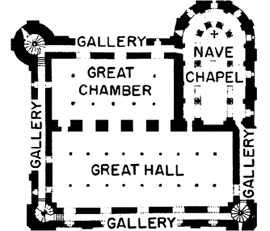 An elevated area, interior or exterior, e.g., minstrel gallery, music gallery, roof gallery. 3. An elevated section of the seating area of an auditorium, esp. the uppermost such space. 4. In buildings for public worship, a similar space, sometimes set apart for special uses. 5. A service passageway within a building, or linking a building underground to exterior supplies or exits. Some service galleries also serve sightseers, e.g., the lighting gallery in the base of the dome at St. Peter’s, Rome. 6. A long, narrow room for special activities like target practice, etc. 7. A room, often top-lit, used for the display of art works. 8. A building serving such art needs. 10. Any raised working platform at the side or rear of a theater stagehouse. 12. (Brit.) A device, attached to a lampholder, for supporting a reflector, shade, etc. A feature reception hallway with vaulted ceiling and turned staircase leads to galleried first floor landing. INSIDESTORY [bar] The property has a canopy porch, reception hall, living room, dining room, study, kitchen/breakfast room, cloakroom, utility room, galleried landing with vaulted ceiling, five bedrooms, an en suite and a family bathroom. From the hall, the staircase rises to a galleried landing, which sweeps round to an impressive guest suite which includes a delightful bedroom with fitted wardrobes and a luxuriously fitted en-suite bathroom which has a Jacuzzi bath and a shower cubicle. Off the galleried dining-landing above the stairs from the lounge is the L-shaped wallpanelled master bedroom. From the very large hallway there's access to a galleried mezzanine level where there are two generous bedrooms, the main one a whopping 17ft long. Other features include hall, dining hallway with galleried landing, sitting room, garden room utility room , master bedroom with en suite, two bedrooms with en suites, a double bedroom with Jack and Jill bathroom and fifth bedroom. To the first floor there is a galleried landing with oak balustrade leading to all four bedrooms; and the family bathroom and WC . Features inside include a bespoke elliptical staircase, period cast iron style fireplaces, coving and ceiling roses not to mention a bespoke kitchen and a galleried first floor landing. The recessed porch has double oak doors into a central reception hall with galleried landing, entry phone system, guest cloakroom with toilet and basin, and storage for coats. On the first-floor is a galleried landing, three large bedrooms, a dressing room, house bathroom and two en-suite bathrooms. An impressive Bath stone portico frames panelled entrance doors, which swing open into an outstanding galleried reception hall showing an impos-ing central staircase and marble flooring. These include a good-sized open-plan living room which has a rustic brick fireplace, a beamed ceiling and an atrium overlooked by the galleried landing.